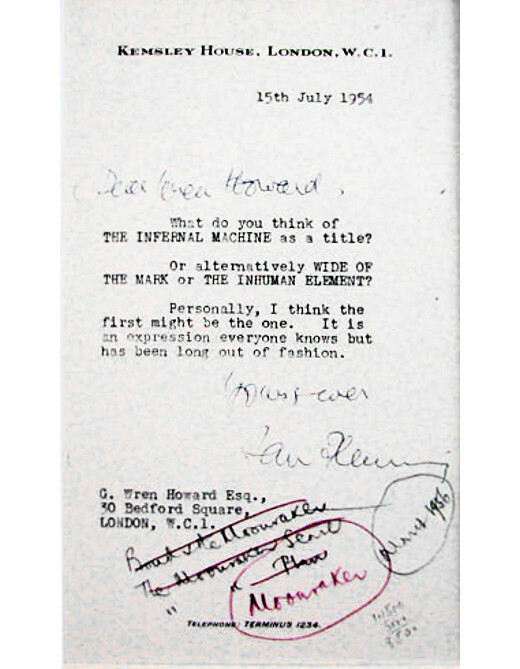 In July of 1954, just a few months after the release of Live and Let Die, Ian Fleming wrote the following letter to his publishers, Jonathan Cape, and suggested some names for the next installment in the James Bond series. "The Infernal Machine" was named as his favourite, but clearly not for long. At the foot of the letter, four more names were scribbled in pen, one of which — Moonraker — was eventually chosen. It was released the next year. Transcript follows. Image kindly supplied by G. Owen. What do you think of THE INFERNAL MACHINE as a title? Or alternatively WIDE OF THE MARK or THE INHUMAN ELEMENT? Personally, I think the first might be the one. It is an expression everyone knows but has been long out of fashion.